Get your chips ready, friends. We’re about to embark on a queso adventure. 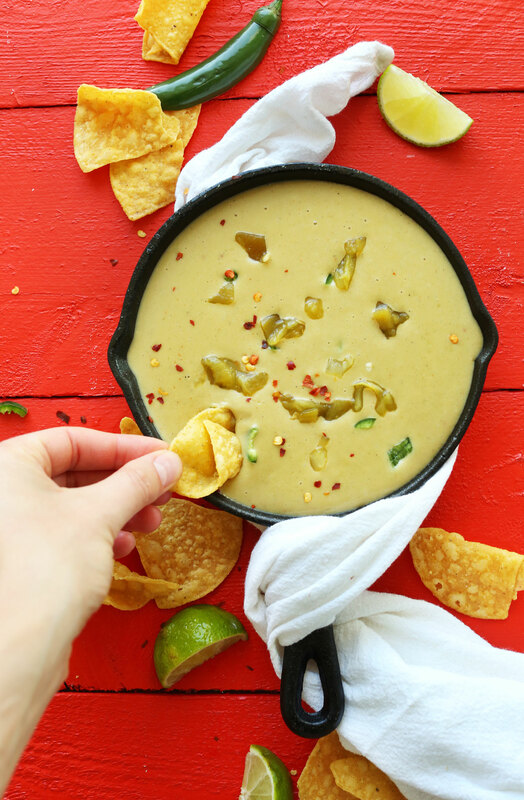 If you’ve followed our blog for a while now, you probably already know about my favorite queso recipe, which is made without cashews and with eggplant instead! That recipe still has my heart because it uses an entire vegetable in place of butter and cheese and whatever else goes into conventional queso dip. Healthy swaps for the win. But, sometimes you don’t want vegetables in your “cheese” dip. Sometimes you just want creamy, buttery goodness that’s a little more on the indulgent side. If that’s the case, then this is the dip for you. The base is garlic, vegan butter (or oil of choice), unbleached all-purpose flour, and plain almond milk. 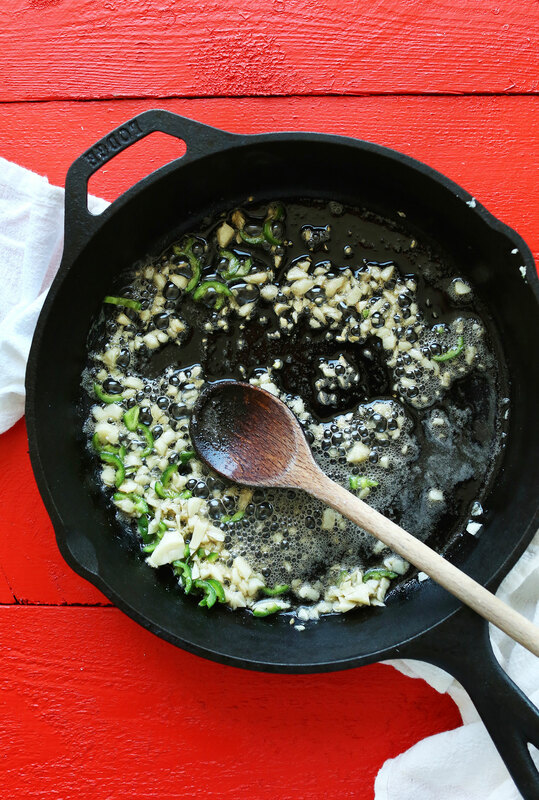 This roux creates a thick, creamy, undetectably-vegan dip. Next comes nutritional yeast for that “cheesy” flavor and mild green chilis for heat. 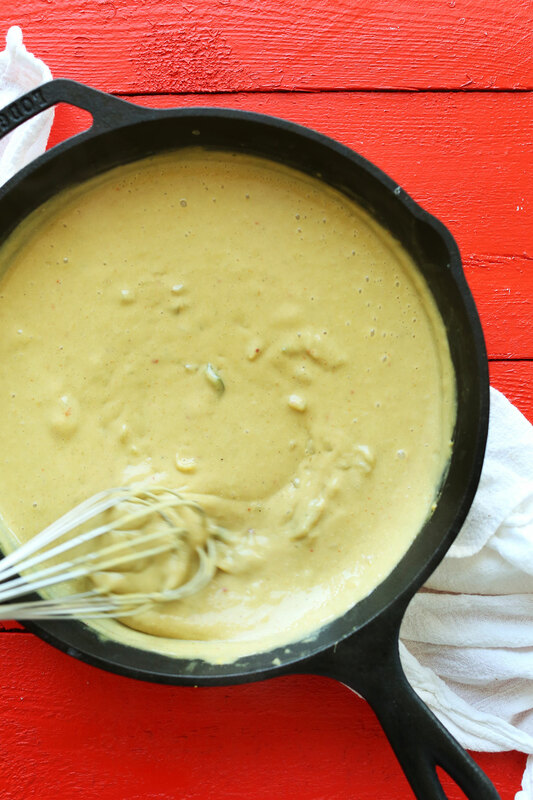 Blend it all together to create the most creamy, luxurious queso dip you’ve ever seen. Guess what? It’s simple! This recipe requires just 10 ingredients and about 20 minutes to make, so you’ll be out the door and on your way to the party with dip in no time. Ready your tortilla chips. This is the perfect dip for Mexican night, sports games, nachos, and more. Serve it alongside my 7-Layer Mexican Dip and watch people swoon. If you try this recipe, let us know by leaving a comment, rating it (once you’ve tried it! ), and tagging a picture #minimalistbaker on Instagram so we can see! Cheers, friends! 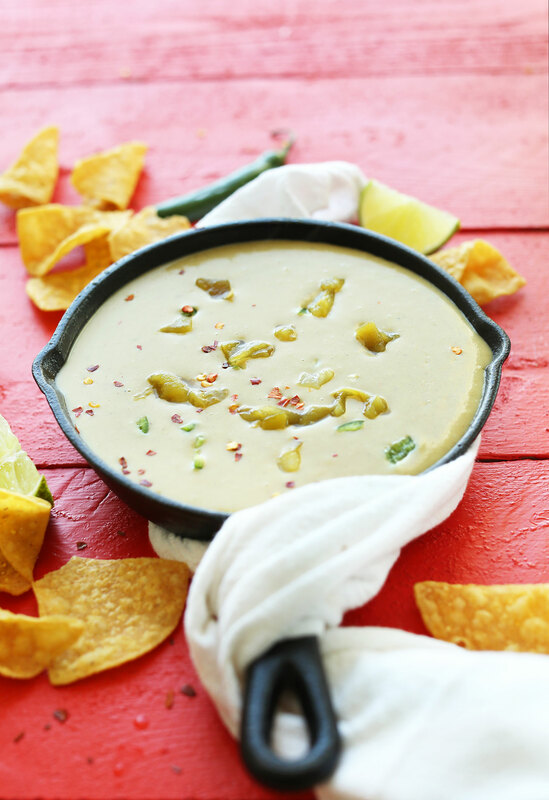 Creamy, flavorful Vegan Queso infused with green chilis for a subtle spice! The perfect plant-based dip for Mexican meals. Heat large skillet or saucepan over medium heat. Once hot, add butter and let it melt and start to sizzle - about 1 minute. Add minced garlic and serrano pepper and stir. Cook for 1-2 minutes, stirring frequently, then turn down heat if garlic starts to brown too quickly. Add flour 1 Tbsp at a time and whisk (see notes for flour-free version). Cook for 1 minute, then whisk in almond milk ½ cup (120 ml) at a time until it no longer looks thick and gloppy - about 1 ¾ cups total (amount as original recipe is written // adjust if altering batch size). Cook in skillet for 2 minutes, whisking frequently. Then transfer to high speed blender. Add nutritional yeast, salt, cumin, half of the green chilis (2 Tbsp as original recipe is written // adjust if altering batch size), sweetener of choice, and hot sauce (optional). Blend on high until creamy and smooth. Taste and adjust seasonings as needed, adding more nutritional yeast for extra cheesiness, salt for savoriness, or sweetener for flavor balance. Transfer back to skillet or saucepan and simmer on low for 5 minutes, whisking or stirring often, to thicken. Turn off heat and add remaining green chilis (2 Tbsp as original recipe is written // adjust if altering batch size). Stir to combine. Garnish with red pepper flakes and fresh cilantro (optional). Enjoy with chips, or atop Mexican dishes, such as nachos, enchiladas, or tacos! Store leftovers in a glass jar or container in the refrigerator up to 4-5 days. Reheat in the microwave or in a small saucepan over medium heat. Best when fresh. *In place of flour, you can sub arrowroot starch or cornstarch to keep this recipe gluten-free. I find the consistency to be not quite as creamy, but it still works! This sounds delicious and I’ll be making it in the next few days. Question…how do you think it would work if I used 1/4 c soaked cashews, blended with minimal water, instead of flour? Cashew cream or what you might call it would thicken up and have a little more nutritional value than flour. Hmm that might work, though we can’t say for sure as we haven’t tested it. If you experiment with it, report back on how it goes, Joys! I just made a version of this by using chickpeas, and it turned out delicious! Perhaps you could give it a try, and make a bomb bean dip with chickpeas and/or navy beans, and with these ingredients. I didn’t add maple syrup, nor did I measure anything, but I thought about this recipe when I was trying to utilize the leftover chickpeas I had. Thank you Dana for inspiring this! Can you use gluten free flour or coconut flour? We haven’t tried GF flour or coconut flour, but would recommend using arrowroot starch or cornstarch to keep this recipe gluten-free! Just wanted to add that instead of transferring everything into the blender I used IMMERSION blender. Saves washing extra equipment. I have made modified version yesterday (20-min. 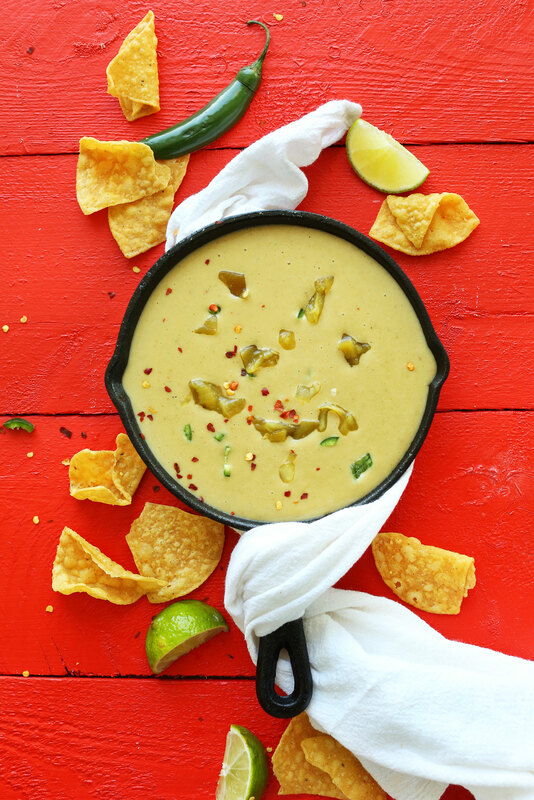 vegan queso) without the pepper from your cookbook to be used in Nacho recipe. My non-vegan family liked it a lot! This was the first time I have attempted vegan cheese and was pleasantly surprised! The recipe is a keeper! Thank you for such innovative and delicious recipes! The hubby and I are confessed ‘chili-heads,’ so I increased the serranos to 2 and used an entire small can of HOT green chilis. I agree with the earlier comment that the sweetener was not needed, so I left it out. I also added some red chili flakes, a shake or two of cayenne and about 1/2t of lemon juice. Note: I used garbanzo bean/chickpea flour which is gf. I don’t have an issue with gluten, but I find this flour works extremely well for thickening sauces without getting ‘gloppy.’ The queso was very creamy. Best queso I’ve ever had, hands down. Thank you! Just made this for lunch today! This is kid approved ( my three loved it)! So yummy and velvety. Thank you for all the great recipes. I bought your cookbook……LOVE IT! Thanks fot another amazing and simple recipe! Loved it! I ate about 75% of the pan by myself! Yum! Made this tonight to drizzle over stuffed poblano peppers. It was delicious! Loved the spice and creamy texture. I will definitely make this again! Great Recipe! Used Adobe peppers.. Soo good! Went perfect with my vegan queso burrito! I have a question.. I doubled the recipe exactly but my sauce won’t thicken. Is it because I doubled it? How can I thicken it without ruining the flavor? Hi Brittney, you could add more flour, arrowroot, or cornstarch to the mix to help thicken it up! To avoid clumping, I usually take about a 1/2 cup of the queso out and then add the thickener to this smaller amount, mixing thoroughly, and finally add it back to the remaining mix! My boyfriend and I made this last night for a Vegan potluck, and it was FANTASTIC. 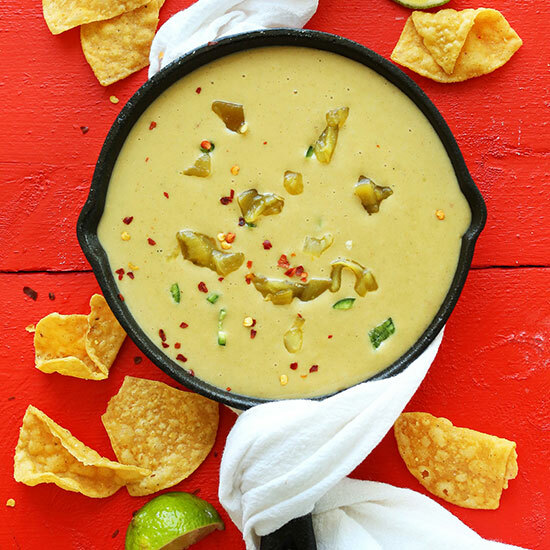 All the reviews that say this is the best vegan queso ever, are RIGHT ON. Delicious! This is my 2nd time making this dip. Yet this time I used arrowroot powder, and finally got the courage and added the Serrano pepper. Perfect! I only added 1/2 the pepper, but I’ll add the whole thing next time. I also used 7oz green chilies (whopping $.69 for the can!). Thanks Dana for such a delicious recipe! I just made this and it is SO GOOD. It is by far the best vegan queso I’ve made. Even my non-vegan fiancé loves it :) Thank you! Yummy! Made this for turkey day weekend campout… let’s say when it is 7 degrees out I can barely eat (gasp) let alone cook no matter how prepared I was with made ahead goodness. We enjoyed nachos once we got home and unpacked on Sunday and I am enjoying again for dinner Monday. My other half didn’t find the flavor too bad and ate a couple of chips before diving into a meat loaded Mexican dish I made. No matter what, I will be making this time and time again and sharing with my aunt [who may already be subscribed and has tried :)] at least! I loved it. It was easy to make. The only thing was it turned out more green than yellow. I will be making this again, thanks! Im super interested in making this for a “friends giving” open house Im having this weekend. Does this do well being left out at room temp? We are going to have a lot of people just coming and going and I want to be able to have munchies that keep well for a few hours just being left on a table. it does best when warm – can you keep it over a flame or heater? Thinking about making this for a party this weekend. Are the ratios still the same when doubling/tripling the recipe? Also would this recipe keep well in a crockpot? Yes and yes! Good luck, Emily! This queso is seriously really good. I added 1 and 1/2 cup almond milk and the consistency was perfect. This will be my go to queso. Thank you! I loved this dip, who am I kidding I love everything you make, this was refreshing to know I don’t need cashews, I spend way too much money on them. I subbed white rice flour to make gf and it was the same texture and thickness as I remember queso to be. My four year old bonus child loved it and my love poored it all over his tacos, he’s not vegan btw, and he didn’t use any shredded cheese. He let me know this was his favorite cheese to date, Thank you! Very good! I made this to go along with your portobello mushroom fajitas and it added a nice creaminess that I miss from not using real cheese. I used it in conjunction with some sour cream (It’s one of the few things I haven’t been able to give up!) and the flavors worked well together, especially with a bit of spice from the serrano. Next time I think I will eliminate the sweetener and taste test it. I used turbinado sugar and I found the sweetness too prominent for me personally. This is the most interesting dip I’ve ever seen! Ha! That’s always a good sign. Thanks for sharing, Jennifer! So glad you enjoyed it. This dip looks so yummy! i love queso, esp the spicy version. i cant wait to try this healthier one!!! Yay! Let me know if you do, Dixya! made this perfectly timed recipe last night as it was (taco) tuesday. it’s a really nice alternative to a cashew-based queso, which i make frequently. very creamy with great flavor. it didn’t thicken up as much as other queso recipes i have tried, but makes a great sauce. Yay! Thanks for sharing, Meridith! YES! So glad I found your blog. I try to eat very healthy and I get burnt out of my same recipes over and over. This was a refreshing blog to go through and find healthier options. Thank you! 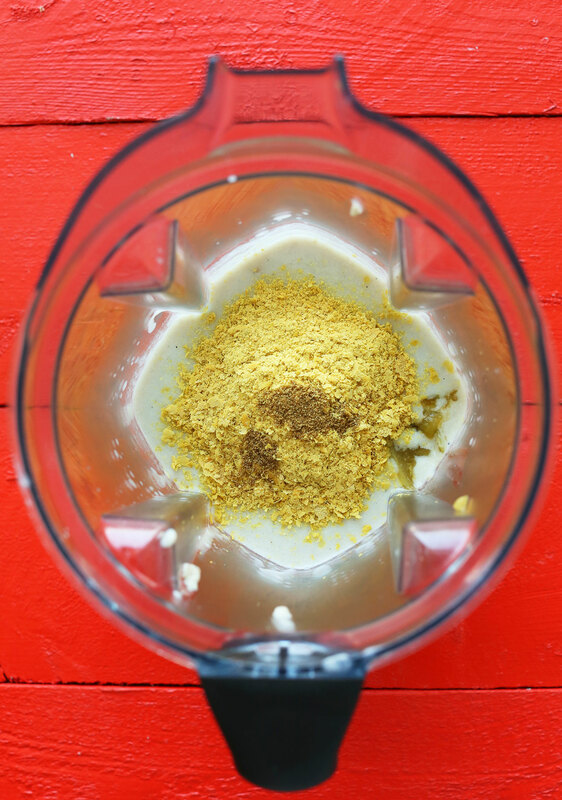 Yum….so where is a good place to buy nutritional yeast? I get mine in bulk at Whole Foods! Awesome! Will get some and try your recipes. Love people like you! That red background deserves allll the heart-eye emojis. Ugh I cannot with this recipe (is that too basic?) It looks SO delicious and creamy!!! Must must make for our next family gathering (or for me by myself in my apartment). Yay! Let me know how it goes, Emilie! That’s awesome! Hope you love this one, too! This sounds and looks delicious. A perfect addition to my game day eats. This looks and sounds so delicious, it’s a perfect Game Day addition. I have been wanting to buy some nutritional yeast to play around with and this might have to be my first attempt! I love queso!